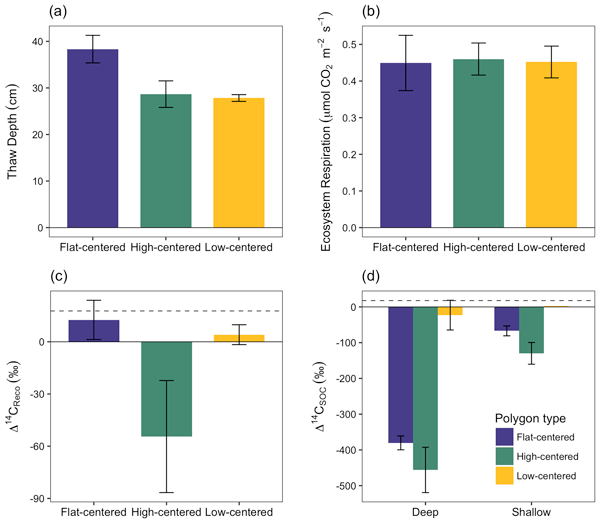 This paper discusses radiocarbon in CO2 and soil organic carbon from Arctic Alaska. From soil chamber measurements, we observed strong seasonal and spatial patterns in 14C of ecosystem respiration, which declined throughout the summer and differed among permafrost features. Radiocarbon in pore-space CO2 indicated decomposition of carbon as old as 3000 years near the permafrost table. Together, these data reveal different rates of old carbon decomposition from distinct permafrost features. Calcifying marine algae (coccolithophores) are key to oceanic biogeochemical processes, such as calcium carbonate production and export. We compile a global database of calcium carbonate production from field samples (n = 2756), alongside primary production rates and coccolithophore abundance. Basic statistical analysis highlights global distribution, average surface and integrated rates, patterns with depth and the importance of considering cell-normalised rates as a simple physiological index. There is broad consensus that wildfire activity is likely to increase in western US forests and woodlands over the next century. Therefore, spatial predictions of the potential for large wildfires have immediate and growing relevance to near and long-term research, planning, and management objectives. The dataset described here is a weekly time series of images (250 m resolution) from 2005 to 2017 that depicts the probability of large fire across western US forests and woodlands. We provide three gridded datasets of manure and fertilizer N inputs in global grasslands at a resolution of 0.5° × 0.5° for the period 1860–2014 (i.e., annual manure N deposition rate, synthetic N fertilizer use rate, and manure N application rate). These three datasets could fill data gaps of N inputs in global and regional grasslands and serve as input drivers for ecosystem and biogeochemistry models. Changing the vegetation cover of the Earth's surface can alter the local energy balance, which can result in a local warming or cooling depending on the specific vegetation transition, its timing and location, as well as on the background climate. While models can theoretically simulate these effects, their skill is not well documented across space and time. Here we provide a dedicated framework to evaluate such models against measurements derived from satellite observations. 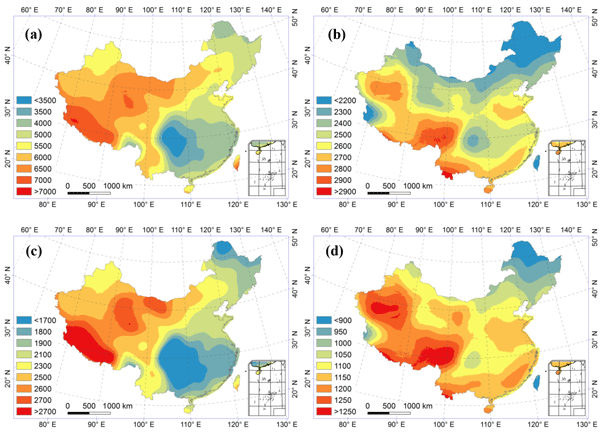 A spatial radiation dataset of China from 1981 to 2010, including global radiation, diffuse radiation, photosynthetically active radiation (PAR), and diffuse PAR, is generated and shared based on several estimation models and observations of the China Meteorology Administration and the Chinese Ecosystem Research Network. This is an integral and consistent radiation dataset for ecological modeling and the analysis of the effects of diffuse radiation on terrestrial ecosystem productivity. A long-term N fertilizer use history is important for both field investigators and modeling community to examine the cumulative impacts of N fertilizer uses. We developed a spatially explicit time-series data set of nitrogen fertilizer use in agricultural land of the continental US during 1850–2015 at a resolution of 5 km × 5 km based on multiple data sources and historical cropland maps. It contains nitrogen fertilizer use rate, application timing, and ammonium and nitrate form fertilizer use. A comprehensive ground reference database for the set-up and validation of models for the satellite-aided retrieval of crop characteristics is presented. Data on the evolution of biophysical and biochemical plant parameters were collected for seven crop types on the Gebesee test site (central Germany) in 2013 and 2014. Field work was carried out on a weekly basis and close to satellite acquisitions. The data reflects spatial heterogeneity and interannual phenological variability. We evaluated the land cover changes based on plant functional types (PFTs) derived from the newly released annual ESA land cover maps. 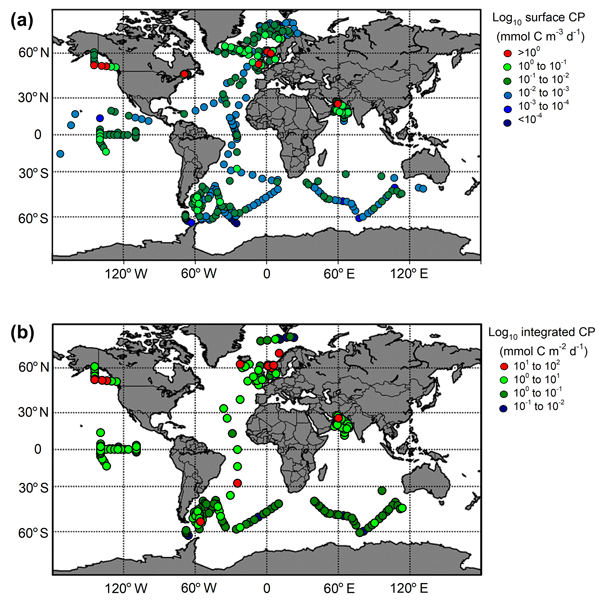 We addressed the geographical distributions and temporal trends of the translated PFT maps and compared with other datasets commonly used by the land surface model community. Different choices of these datasets for the applications in land surface models are proposed depending on the research purposes. We quantified in detail the P budgets in agricultural systems and PUE on global, regional, and national scales from 2002 to 2010. Globally, half of the total P inputs into agricultural systems accumulated in agricultural soils, with the rest lost to bodies of water. There are great differences in P budgets and PUE in agricultural systems on global, regional, and national scales. International trade played a significant role in P redistribution and P in fertilizer and food among countries. This is an update of HYDE, which is an internally consistent combination of historical population estimates and time-dependent land use allocation algorithms for 10 000 BCE–2015 CE. Categories include cropland, separated into irrigated and rain-fed rice and non-rice crops. Grazing lands are divided into more intensely used pasture and less intensively used rangelands. Population includes total, urban, and rural population and population density and built-up area. Fires occur in many vegetation types and are sometimes natural but often ignited by humans for various purposes. We have estimated how much area they burn globally and what their emissions are. Total burned area is roughly equivalent to the size of the EU with most fires burning in tropical savannas. Their emissions vary substantially from year to year and contribute to the atmospheric burdens of many trace gases and aerosols. The 20-year dataset is mostly suited for large-scale assessments. 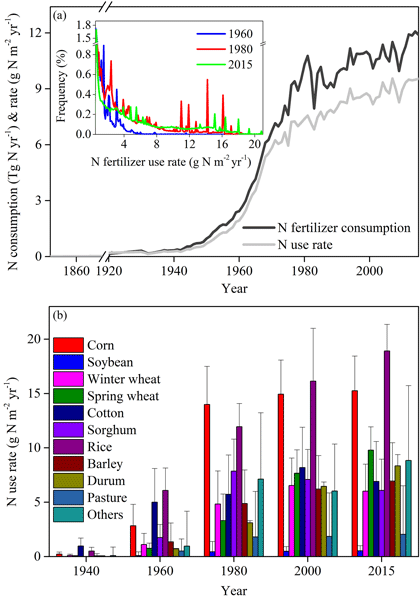 This work addressed how manure nitrogen (N) production and application to cropland have changed over time and space. The 5 arcmin gridded global dataset of manure nitrogen production generated from this study could be used as an input for global or regional land surface and ecosystem models to evaluate the impacts of manure nitrogen on key biogeochemical processes and water quality. This work has addressed how agricultural nitrogen and phosphorous fertilizer use has changed over time and space. The final product covers global agricultural land, spanning from 1961 to 2013 at a spatial resolution of 0.5° × 0.5° latitude by longitude. It can serve as an important input driver for regional and global assessment and Earth system modeling of agricultural productivity, crop yield, greenhouse gas balance, global nutrient budget, and ecosystem feedback to climate. Available historical global N fertilizer map as an input data to global biogeochemical model is still limited and existing maps were not considered NH4+ and NO3− in the fertilizer application rates. In our products, by utilizing national fertilizer species consumption data in FAOSTAT database, we succeeded to estimate the ratio of NH4+ to NO3− in the N fertilizer map. The products could be widely utilized for global N cycling studies. Carbon dioxide (CO2) emissions from human activities (burning fossil fuels and cement production, deforestation and other land-use change) are set to rise again in 2014. 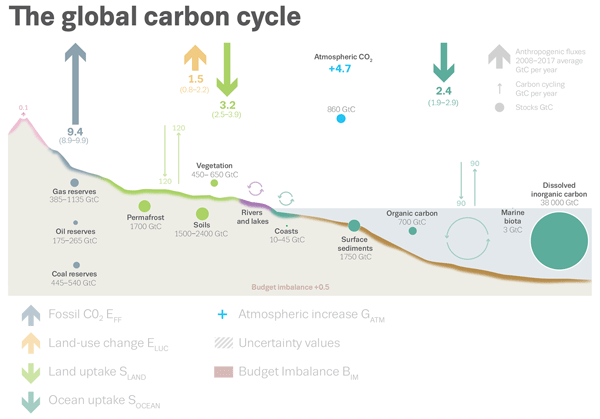 This study (updated yearly) makes an accurate assessment of anthropogenic CO2 emissions and their redistribution between the atmosphere, ocean, and terrestrial biosphere in order to better understand the global carbon cycle, support the development of climate policies, and project future climate change. Alelign, A., Teketay, D., Yemshaw, Y., and Edwards, S.: Diversity and status of regeneration of woody plants on the Peninsula of Zegie, Northwestern Ethiopia, Trop. Ecol., 48, 37–49, 2007. Alemayehu, W.: Forest Resources in Amhara: Brief Description, Distribution and Status, in: Social and Ecological System Dynamics-Characteristics, Trends, and Integration in the Lake Tana Basin, edited by: Krystyna, S., Goraw, G., and Shimelis, A., Ethiopia, Springer, 231–243, 2017. Amhara National Regional State (ANRS): A strategic plan for the sustainable development, conservation, and management of the woody biomass resources, Final Report, 2004. Aster, D. Y. and Seleshi, B. A.: Characterization and atlas of the Blue Nile Basin and its subbasins, International Water Management Institute, available at: http://publications.iwmi.org/pdf/H042502.pdf (last access: 12 November 2018), 2009. Ayalew, W.: Improving management of shoreline and riparian wetland ecosystems: the case of Lake Tana catchment, Ecohydrology Hydrobiology, 10, 123–132, https://doi.org/10.2478/v10104-011-0017-4, 2010. Belward, A. S. (Ed. ): The IGBP-DIS Global 1 km Land Cover Data Set (DISCover): proposal and implementation plans, IGBP-DIS Working Paper 13, International Geosphere–Biosphere Programme Data and Information Services, Toulouse, France, 1996. Bijan, D. and Shimelis, G. S.: Combined 3D hydrodynamic and watershed modelling of Lake Tana, Ethiopia, J. Hydrol., 398, 44–64, https://doi.org/10.1016/j.jhydrol.2010.12.009, 2011. Birru, Y., Anteneh, A., and Tadele, A.: Expansion of eucalyptus woodlots in the fertile soils of the highlands of Ethiopia: could it be a treat on future cropland use?, J. Agr. Sci., 5, 97–107, https://doi.org/10.5539/jas.v5n8p97, 2003. Bishaw, B.: Deforestation and land degradation in the Ethiopian highlands: a strategy for physical recovery, Northeast African Studies, 8, 7–26, https://doi.org/10.1353/nas.2005.0014, 2001. 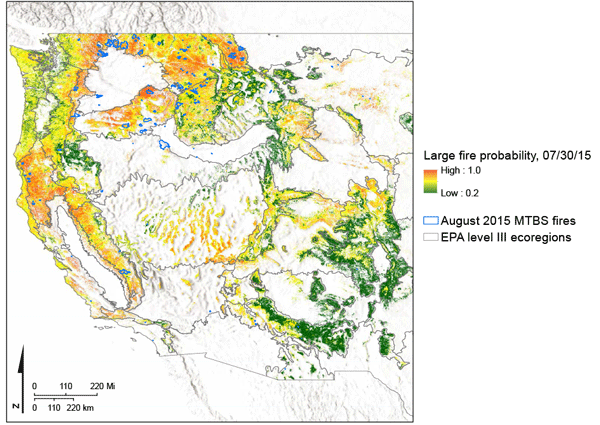 Darvishzadeh, R., Atzberger, C., Skidmore, A., and Schlerf, M.: Mapping grassland leaf area index with airborne hyperspectral imagery: A comparison study of statistical approaches and inversion of radiative transfer models, ISPRS J. Photogramm., 66, 894–906, 2011. Di Gregorio, A. and Jansen, L.: Land cover classification system, concepts and user manual, GCP/RAF/287/ITA Africover, Food and Agriculture Organization of the United Nations Publishing Service, Rome, 2000. Friis, I.: Forest and forest trees of northeast tropical Africa-their nature habitats and distribution patterns in Ethiopia, Djibouti and Somalia, Kew Bull. Additional Series, No. 15, i-iv, 1–396, London, HMSO, 1992. Friis, I., Sebsebe, D., and van Paulo, B.: Atlas of the Potential Vegetation of Ethiopia, Addis Ababa, Addis Ababa University Press & Shama Books, 2011. Institute of biodiversity conservation (IBC): Ethiopian Biodiversity Strategy and Action Plan, available at: http://www.cbd.int/doc/world/et/et-nbsap-01-en.pdf (last access: 12 November 2018), 2005.
International Fund for Agriculture Development (IFAD): Community-based Integrated Natural Resources Management in the Lake Tana Watershed, Ethiopia, on Forestry, Agroforestry, Soil Conservation, Bahir Dar, 2007a. International Fund for Agriculture Development (IFAD): Community-based integrated natural resources management project in Lake Tana Watershed, Ethiopia (3rd draft), Bahir Dar, 2007b. Pichi Sermolli, R.: Una carta geobotanica dell's Africa Orientale (Eritrea, Ethiopia, Somalia), Webbia, 13, 15–132, 1 map, 1957. Sebsebe, D. and Friis, I.: The vegetation type in Ethiopia, in: The Flora of Ethiopia and Eritrea, edited by: Hedberg, I., Friis, I., and Persson, E., National Herbarium, Addis Abeba & Uppsala University, Uppsala, 8, 27–32, 2009. Sebsebe, D., Mengistu, W., and Yilma, D.: Ethiopia's natural resource base, in: Important Bird Areas of Ethiopia. A First Inventory, edited by: Edwards, S., Ethiopian Wildlife and Natural History Society, Addis Abeba, 36–53, 1996. Sebsebe, D., Cribb, P., and Rasmussen, F.: Field guide to Ethiopia orchids, Royal Botanic Gardens, Kew Bulletin, 59, 653, 2004. Shimelis, A. Z.: Birds of Lake Tana area, Ethiopia, A photographic field guide, View Graphics and Printers, Addis Ababa, 2013. Shimelis, G. S., Ragahavan, S., and Bijan, D.: Hydrological modelling in the Lake Tana Basin, Ethiopia using SWAT model, The Open Hydrology Journal, 2, 49–62, https://doi.org/10.2174/1874378100802010049, 2008. Song, C. Y., Nigatu, L., Beneye, Y., Abdulahi, A., Zhang, L., and Wu, D. X.: Vegetation map of Lake Tana basin, IBCAS, Dataset, https://doi.org/10.4121/uuid:48d45053-36f6-411b-96b1-7ae0e22d56d0, 2018. Teketay, D.: Deforestation, wood famine and environmental degradation in Ethiopia's highland ecosystems: urgent need for action, Northeast African Studies, 8, 53–76, https://doi.org/10.1353/nas.1995.0010, 2001.
von Breitenbach, F.: The Indigenous Trees of Ethiopia, 2nd revised and enlarged edition, Ethiopia Forestry Association, Addis Abeda, 1963. White, F.: The vegetation of Africa. A descriptive memoir to accompany the UNESCO/AETFAT/UNSO vegetation map of Africa, with map in 3 parts + legend, Paris, UNESCO, 356 pp., 1983. Wubneh, B. A. and Amare S. M.: Land Use and Watershed Management Practices in Lake Tana Basin, in: Social and Ecological System Dynamics-Characteristics, Trends, and Integration in the Lake Tana Basin, edited by: Krystyna, S., Goraw, G., and Shimelis, A., Ethiopia, Springer, 231–243, 2017. Yimenu, A.: Characterization of domestic wastewater disposal as point source pollution in southern gulf of Lake Tana, Northwestern Ethiopia. MSc. Thesis, Environmental Science Program, School of Graduate Studies, Addis Ababa University, Addis Ababa, Ethiopia, 2005.